When Is A Debt Notice, Delivered By A Debt Collector, Not A Debt Notice? Kathryn Campbell Secretary Department of Human Services before a Senate Committee hearing into the Centrelink robo-debt collection in Canberra. 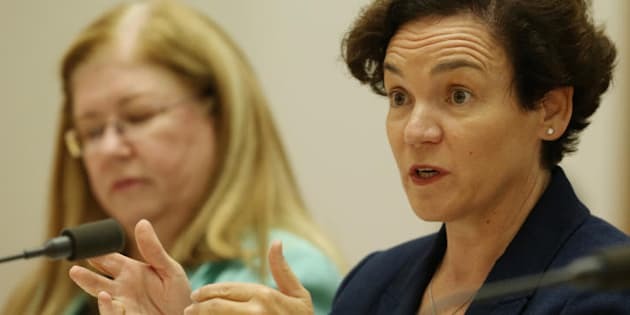 CANBERRA -- There is no doubt Centrelink's controversial robo-debt program is under fire and so is the use of words used to describe what it has been doing. Since last August, the automated data-matching debt recovery system has affected more than 200,000 people and caused despair and a "climate of fear," according to Australia peak welfare group ACOSS, as debts are seriously queried and thousands of welfare recipients have debt collectors sent to their homes. The recently introduced system involves a reliance on data matching income reported to Centrelink and separately to the Australian Tax Office, but as mistakes are found, and debts are called in regardless. But Department of Human Services, which runs Centrelink, wants to get down to the fine details and is contesting -- as it appeared before a parliamentary committee -- whether the debt notices, which have so alarmed recipients, are actually debt notices. "I am going to talk about initiating letters," explained Department of Human Services boss, Kathryn Campbell. "The initial letter is a request to clarify when there are two different data sets. Now often I hear it talked as a debt notice and I just want to be very clear that is not our interpretation. It is a request to do it." So the system sees a debt, but we are told its automatic response is not a debt notice. It is also not an "inaccurate debt notice," which was raised by Labor Senator Murray Watt. No, not indeed. "You can't deny those initiating letters in saying to someone 'we think there is an error here' and that turns out to be wrong, that is inaccurate?" he asked with hands in the air. "No I don't accept that Senator," the DHS Secretary responded. DHS boss Kathryn Campbell has previously said 20 percent of cases have been cases where the debt was wrong, she explained on Wednesday the they are not actually "wrong". "The initiating letters are provided and in 20 percent of cases the individual involved is able to provide information that clarifies that difference which then results in no debt," she said. "So I don't think inaccurate is appropriate." Clear? It was not wrong and it was never a debt notice. Campbell does acknowledges people will be distressed by the robo-debt system, but she blames the media for causing some of this distress.